I, Howard P. Lovecraft of the city of Providence in the State of Rhode Island, being of sound mind and memory, make, execute and declare this instrument as my last will, hereby revoking any and all former wills by me at any time heretofore made. First: I direct that my executor pay out of my estate all my just debts and funeral expenses. Second: All the rest, residue and remainder of my property and estate, real, personal and mixed, however described and wherever situated, of which I die seized and possessed, or in or to which at the time of my decease I have any right, title or interest, I give, devise and bequeath to my mother Sarah S. Lovecraft – To Have and To Hold the same unto and to the use of herself and her heirs and assigns forever. Third: In case my said mother should not be living at the time of my decase, I give, devise and bequeath said rest, residue and remainder of my property and estate absolutely and in fee simple, two thirds thereof to my aunt Lillie D. Clark, wife of Franklin C. Clark, of said Providence, and the remaining one third thereof to my aunt Annie E. Gamwell, wife of Edward F. Gamwell of the city of Cambridge in the State of Massachusetts, or in case either of my said aunts shall decease prior to my death without leaving any descendant living at the time of my death to take by representation such deceased's share in my residuary property and estate, I give, devise and bequeath such share to the other of them, or if she also shall have deceased prior to the time of my death, to the descendants of such other equally but per stirpes and not per capita. 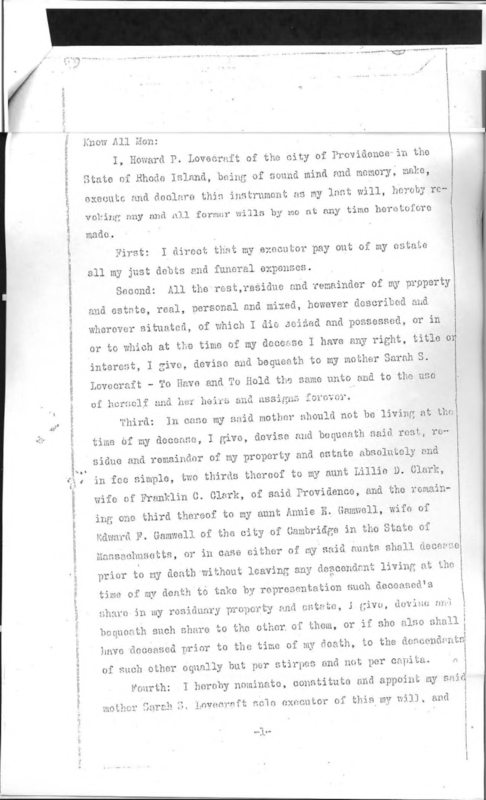 Fourth: I hereby nominate, constitute and appoint my said mother Sarah S. Lovecraft sole executor of this my will, and if for any reason she should not service or continue to serve my said aunt Lillie D. Clark, and if for any reason neither my said mother nor my said aunt shall serve or continue to serve Albert A. Baker of said Providence as sole executor hereof, and I hereby request and direct any and all courts taking probate hereof not to require any of said persons to furnish any surety on any bond, or to file any inventory or to return any account of my estate as such executor. In Witness Whereof I have hereunto set my hand and seal and declard this to be my last will, in the presence of three witnesses, at Providence, Rhode Island, this twelfth day of August, A.D., 1912. 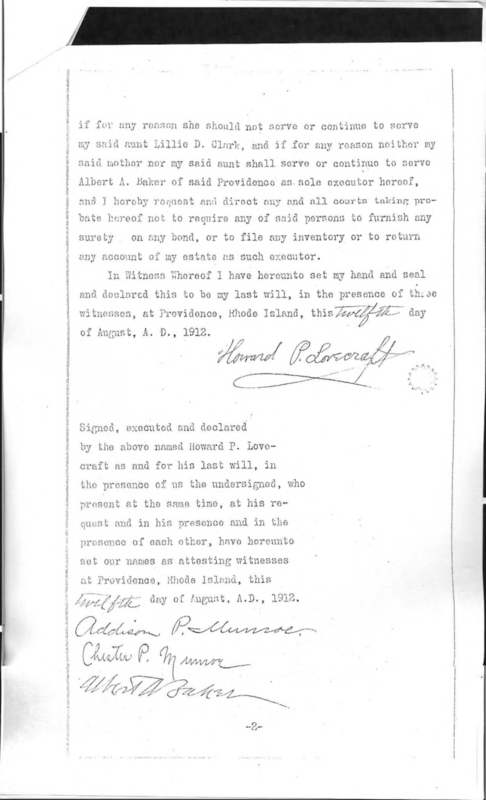 Signed, executed and declared by the above named Howard P. Lovecraft as and for his last will, in the presence of us the undersigned, who present at the same time, at his request and in his presence and in the presence of each other, have hereunto set our names as attesting witnesses at Providence, Rhode Island, this twelfth day of August, A.D., 1912.